Marple Hall is probably Marple's greatest historical loss. If it had survived a few more years it may have become a tourist attraction like Bramhall Hall but sadly that was not to be and all we can do today is speculate what might have been. However, at least you can at least take a Guided Tour of the hall through these pages and learn something about the incredible history that helped shape the community we live in today and discover a few relics that people managed to save. The date of the original house on the Marple Hall site is uncertain, it was probably built by the Vernons of Haddon Hall during the reign of Henry VII. The Vernons held the manors of Marple and Wybersley through several generations, the last being Sir George Vernon. He died without male heirs, so the estates were divided between his two daughters. Margaret, the eldest, married Sir Thomas Stanley, second son of the Earl of Derby. The other daughter was the famous Dorothy Vernon who married Sir John Manners. The following is an extract from "East Cheshire Past and Present" by J.P. Earwaker M.A., F.S.A. published in 1880. Marple Hall, for many generations the residence of the Bradshawes, is picturesquely situated on somewhat high ground, having a very precipitous descent at the back to the meadows and woods, through which flows the river Goyt. Its general appearance from the front is shown in the plate opposite page 61 (below). 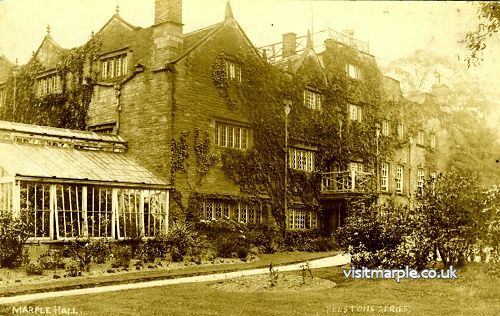 During the 1920's and 30's when Marple Hall was looked after by caretaker Harry Cotton, it was open to visitors from the public. The following descriptions are compiled from copies of the tour guides published by Harry and also by Frank Tunstall during this period. The full versions of these guides are available at Marple Library in the Local Heritage section. A Short Guide and History of Marple Hall by Harry Cotton, Printed by the author at Marple Hall 1934. The demolition of Marple Hall in the late 1950's was a tragic loss to Marple's heritage. 300 years of history swept away almost without trace is a sad reflection on the Council of that time and also the members of the Isherwood family involved. That so little remains in Marple today to remind us of this historic place is deeply disappointing, as is the disgraceful vandalism which brought about the hall's demise. In 1954, when Marple Hall was derelict and abandoned to the vandals, thankfully someone had the foresight to preserve a small part of the treasures it contained. The stained and painted glass shown here was salvaged from the entrance hall and reinstalled in the vestry of the ancient Church of Bunbury in South Cheshire, where it remains to this day.